Traditional building economics has primarily been concerned with issues around project appraisal and cost management techniques. 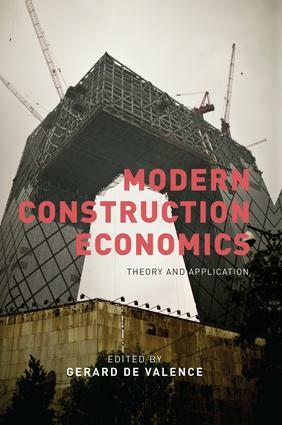 On the other hand, modern construction economics has a wider focus with stronger links to mainstream economics, reflecting an increased interest in a range of theoretical issues in construction economics, both at the macro and micro level. In Modern Construction Economics: Theory and Application, a variety of approaches are used to present a coherent vision of synthesis between industry economics and project economics. collusion and corruption in the construction sector. Including contributions from academics in the UK, Sweden, Hong Kong, and Australia, this is a truly global review of a core issue for the construction industry worldwide. The result is a unique book that will push toward the development of a comprehensive theoretical framework of construction economics. This is a must-read for all serious students of construction economics, and all practitioners looking for a deeper understanding of their industry. "This book brings together a stimulating selection of thinking and writing that deserves the attention of experienced researchers and industry representatives." Gerard de Valence teaches in the undergraduate and postgraduate construction and property courses in the School of the Built Environment at the University of Technology, Sydney. In the 1990s he participated in many State and Commonwealth Government inquiries into the construction industry and has a particular interest in industry policy. He has published widely on theoretical and management issues in property and construction and was co-editor of the three volume Building in Value series of books. Since 2003 he has been Coordinator of the Working Commission on Building Economics for the International Council for Building Research and Innovation.